This is an automatic shutter unit made for a camera and is a beauty. Complete with 2 solenoids, cadmium sulfide photo electric light sensor that determines the exposure and tells the solenoids when to open and close and hence the shutter speed. 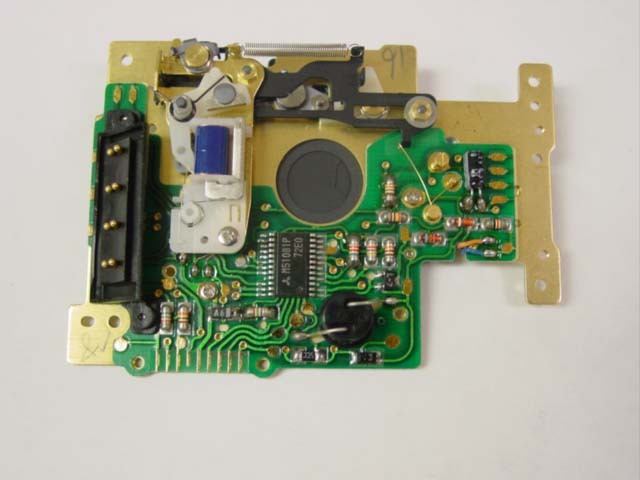 Has a Mitsubishi M51081P integrated circuit which we believe to be a self timing chip and film speed sensor. We don't know what camera it was made for and don't have voltage requirements or other specs. Assembly is 2-3/4" long by 2"
wide. Shutter opening is 1/2". They are marked "7X1E". Unused in original static shielding bag.